VaporX5™ Next Gen combines a unique and powerful blend of sensory ingredients with a potent dose of a precise caffeine molecule for the ultimate pre-workout experience and a sensory overload you won’t find anywhere else. 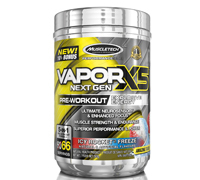 To make the VaporX5™ Next Gen formula complete, MuscleTech® researchers added a potent dose of caffeine that will fire you up and help power you through your hardest training sessions. Caffeine is shown to enhance thermogenesis, increase energy and enhance mental focus. Also, the precise dose of taurine in two scoops of VaporX5™ Next Gen has been shown in scientific research to boost performance in endurance athletes. This study was published in the journal Amino Acids. Every flavor of VaporX5™ Next Gen was flavored by experts in one of the world’s top flavoring houses in order to taste better than any other pre-workout powder on the market! We’re confident you’ll love the delicious flavors! Directions For NANO VAPOR: This is an extremely strong product. Please read the entire directions before consuming, and follow the tolerance assessment protocol. Assess your tolerance first by mixing 1 serving (1 scoop) with 4 oz. (120mL) of cold water and drinking it about 30 minutes before your daily workout. Then increase the dosage to 2 and then 3 servings mixed with 8 to 12 oz. (240-355mL) of cold water before workout out. 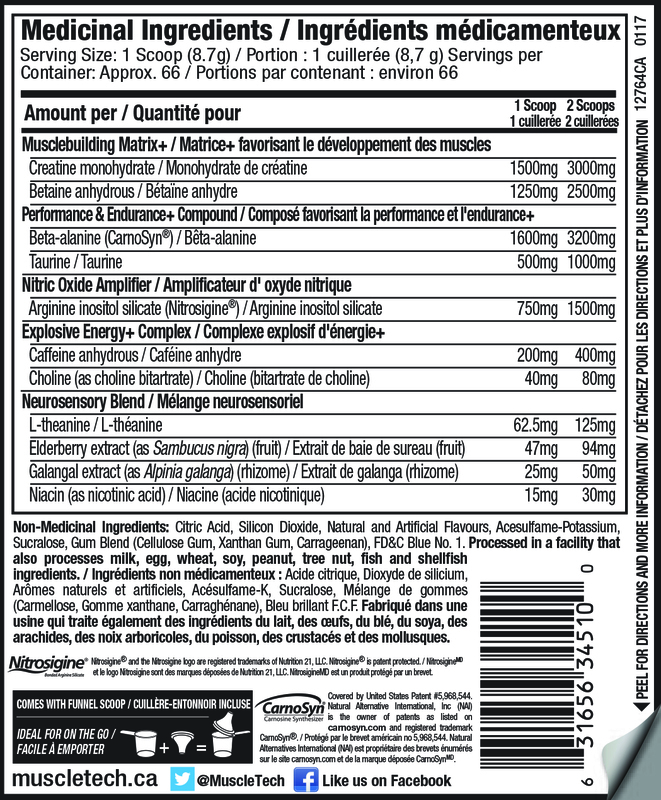 Do not exceed 3 servings (3 scoops) in a 24-hour period. Maintain an adequate state of hydration during use. 1. Pérez-Guisado et al., 2010. Journal of Strength and Conditioning Research. 24(5):1215-1222. 2. Owen et al., 2008. Nutritional Neuroscience. 11(4):193-198. 3. Goldstein et al., 2010. Journal of the International Society of Sports Nutrition. 7:5. 4. Schwedhelm et al., 2007. British Journal of Clinical Pharmacology. 65(1):51-59. 5. Loke et al., 2008. American Journal of Clinical Nutrition. 88:1018-1025. 6. Buford et al., 2007. Journal of the International Society of Sports Nutrition. 4:6. 7. Hoffman et al., 2006. International Journal of Sport Nutrition and Exercise Metabolism. 16:430-446. 8 .Hoffman et al., 2009. Journal of the International Society of Sports Nutrition. 6:7.